Rigging screw body with fork and clevis pin at one end with lock nut and blank the opposite end, manufactured from A4-AISI marine grade stainless steel. Traditional style fork to blank turnbuckle manufactured from high quality 316 grade solid stainless steel bar which is then polished to a mirror finish. Also called rigging screws, tensioners, bottle screws or adjusters. Normally used with lock nuts. Available in a variety of combinations. Also available with Marine Bodies or Open Bodies. Bronze thread inserts are used on all sizes 3/4' and above, to eliminate the possibility of thread seizure. 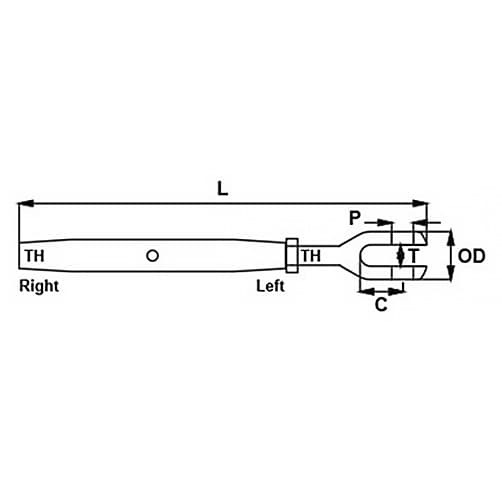 Turnbuckle bodies of 3/4' thread and above, are supplied with with four spanner flats, located in the centre of the body (See image below). 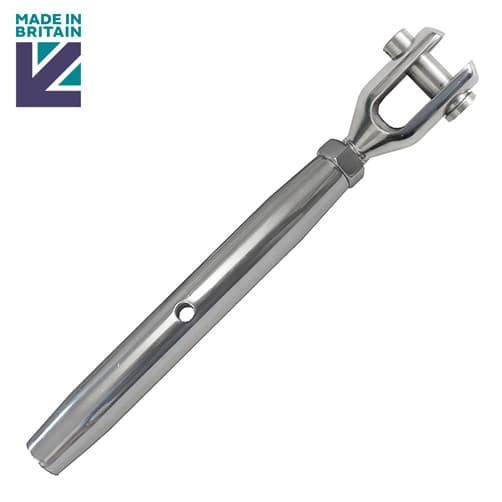 This high quality stainless steel turnbuckle body with threaded fork to blank ends has been engineered and manufactured here in the UK. Video: Stainless Steel Turnbuckles. How do they work? Stainless Steel Turnbuckles - Closed Body Rigging Screws. Demonstration of the mechanics of closed body stainless steel turnbuckles.